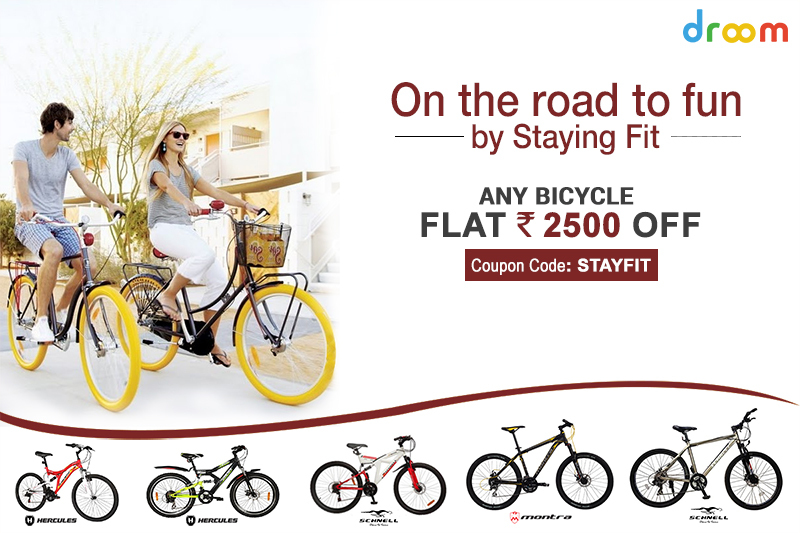 Droom Coupon: Flat ₹2500 Off Bicycles! If you are looking forward to buy a bicycle, then here’s a hot deal. At droom.in you can find incredible deals on bicycles along with coupons for cars, motorbikes and other automobiles. Take up this opportunity to revamp your fitness regime while contributing to environment. Droom.in is helping you stay ahead of your New Year resolution to lose weight by currently offering flat ₹2500 off any bicycle. Grab latest models, known brands, and comfort to shop from the couch along with breathtaking savings. Make sure to use coupon code “STAYFIT” to avail savings of ₹2500. Droom discount coupons provide fabulous way to save on your most loved vehicle. Budding flowers, sprouting new leaves, and soothing sunshine is marking the change of season. It’s high time to rejuvenate and revive your body to get ready for the coming season. The best way to get in shape is cycling. And best part is that you don’t have to take out extra time for it, you can opt for bicycle while going office, school, college, market and anywhere else. This will help reducing pollution while shaping up your curves. Cycling improves rate of heartbeat, saves money and fuel, reduces weight, controls stress (one of the major problems seen in the present culture), keeps you energetic and on top of everything saves time by avoiding those chocking roads. So, start tapping now! Download droom app to save huge on automobiles.